Born of the traditions of the Old West, the Rough Rider maintains much of the look and feel of the legendary Single Action Army revolver, only in a scaled down version. Chambered for the .22LR cartridges, the Rough Rider is manufactured using state-of-the-art precision machinery that assures its accuracy and reliability. The cylinder lock-up is tight and the perfect timing of the action makes for a handgun that will put its shots where you want 'em. does this include the .22 magnum cylinder? BEST ANSWER: However, you can easily get one from Heritage. Mine came with instructions on how to do so. Relatively inexpensive. No. Look up the model number. I can't link to their site, but no, it only comes with the 22LR cylinder. Can you ship this to Minnesota? BEST ANSWER: No. They do not pass MN melt law standards. will you ship this gun to california? BEST ANSWER: Sounds like a communist state. Yes, it is "allowed" here in CA. Does it come with separate cylinder for .22 magnum or may either be loaded in same cylinder? BEST ANSWER: It would have to have 2 cylinders there is no cylinder that can fire both cartridges. 22 mag cylinder will shoot 22 mag and 22 lr cartridges but 22 lr will not shoot 22 mag bullets.... Been doing it for years. Rifle or pistol the same. Can California residents purchase this weapon? Only if you go to Nancy Pelosi's house and ask for her personal blessing. Best advice is to leave the state of California, if possible. Does this pistol sold with both cylinders? Can you buy a magnum cylinder for this model? can I mount a laser beam on this? BEST ANSWER: The only way for that would be to replace the wood grips; there's no attachment points for lasers or lights. Maybe if they make something to attach in the trigger gaurd but there is no rail to mount to. Do you have to remove cylinder to unload and reload? BEST ANSWER: No, you just use the ejector rod to unload either an fired or unfired case from each chamber in the cylinder one at a time. You eject one chamnber then rotate the cylinder to the next chamber and eject it using the ejection rod. I hope this helps. I would almost guarantee the manual for the pistol will cover this with better words and actual figures. Don't worry it is not hard. Just make sure the ejector rod is ligned up with the cylender you are trying to unload. Is it drilled for a scope mount? If not can it be? It's not drilled for a scope mount. I believe it is made of cast alloy, I wouldn't try it. It's a nice plinker. I use it for snakes & rodents. No, it does not come drilled for a scope mount. RE: Can it be ? That's a question for a gunsmith to answer. No, it's not drilled, and there is no place for it to be drilled and mounted. It is not drilled for a scope, it would be difficult to drill for a scope. It is not drilled for a scope mount. I suppose it could be..
can 22 cal shorts be used? BEST ANSWER: The specification sheet reads: "22 LR (includes 22LR, 22 Long, 22 Short, 22 CB (in cap, short, and long lengths) and 22 WMR. A 22lr cartridge doesn't fill the entire chamber of the cylinder, so 22short should be no problem. BEST ANSWER: According to the Heritage Manufacturing site and the Specifications for the RR22B6, the frame is "Aluminum Alloy". Heritage offers steel frame models. They are designated with a Model Number that begins with an "S". It can not be all steel, metal or any alloy for that matter. I can clearly see wood in the picture. The barrel and the cylinder are steel, the rest is aluminum. But its a good gun with some weight to it. I have three of them. They do make an ALL steel version as well but it costs more. Trigger and grips are not. Will this accept the 22 mag cylinder? Yes, but it does not come with it. You have to order it from the Heritage website. Yes, you can get one on the heritage website. Shoots better with the 22mag also. Yes. You can find the 22 mag cylinder on the Heritage website. Yes it will recieve one and function properly. Yes, it can be purchased from Heritage Arms. Does it do good with rat 🐀 shot ?? BEST ANSWER: If that’s anything like buckshot, your good. Do I have to get this sent to a local gun shop ,or can it be sent to my home I'm in North Carolina? Does this have to be shipped to a ffl or can it be shipped to my home? BEST ANSWER: In compliance with Federal Law, it must to be shipped to a FFL. It cannot be shipped to your home unless you are the holder of a FFL. Can this be shipped to my home in Michigan? BEST ANSWER: It must to be shipped to a FFL in Michigan.. It cannot be shipped to your home unless you are the holder of a FFL. How can I get a holster for the gun? This is a good 22 pistol for plinking or small rodent hunting. Easy to operate and shoots straight. 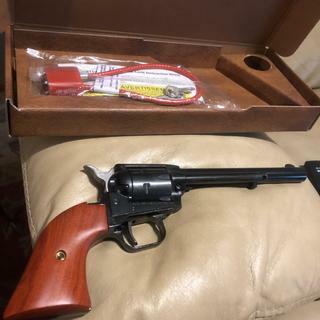 I'm impressed with its quality for the price once you figure out how to use an single action revolver. Super fun and inexpensive plinker revolver, I’d recommend it highly as it’s a no frills target gun. I really enjoy it simple and fun just buy it you won’t regret it, promise! It’s not like a magizined pistol so it’s a little more work but in a very short time you can gain enough practice to speedily change rounds. Great little weapon, accurate out of the box. I ordered the 22mag cylinder too. Just as advertised, but better. Came it 5 days after ordering. Cleaned and inspected before going to the range then 100rds Remington Yellowjackets just to see if it will shoot reliably, it did. This last weekend another couple hundred of the yellowjackets from a sandbag at 25yds. 3.5” group 9 o’clock 3inches out. When my 3,000rds of CCI Mini-Mag come in we go back to the sandbags, regroup and move the front sight accordingly. The 22WMR Cylinder only took 4 days to come in when ordered online. Very much a keeper. Nice plinker. Very simple. Snake & rodent assassin. I didn't buy this rough Rider revolver from PSA (sorry folks), but I can definitely attest that this revolver is worth every single penny. I got it for my 8-year-old twins to get them shooting safely and with confidence. The revolver runs 22 Colibri (22 with no powder) all the way up to high-velocity 22LR ammo. Fantastic for teaching and letting new shooters enjoy shooting. No pain, no freak-out recoil - just easy shooting for almost no money. Hundreds of rounds so far and *zero* problems. Highly, highly recommended. I got it on sale and it’s the cheapest gun I own. I took it to the range and during the course of a few hours I put 300 rounds through it while shooting my other guns. The only problem I had was when a friend of mine didn’t eject a round properly and it got stuck between the cylinder and the frame which stopped the cylinder from rotating. But I removed the cylinder pretty easily and it shot great from then on. Good product for the price. Shoots good and very accurate. I’m sure you could pay 3 times more and get little better quality but if you want 22lr that goes bang, bang then pull the trigger on this pistol! Can't beat the price....for $110 on sale it performs very well! 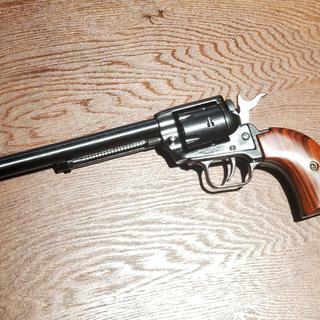 A simple Single Action Revolver. Gun Quality is very good. Rotates smooth, ejects Round smooth, very nice. I like it. I haven’t fired the gun yet but for $30 and free shipping you can get another cylinder that will allow you to shoot 22 Magnum which alone is worth the price. Solid built gun. Very good deal! Once the front sight is adjusted, these are pretty accurate. I have used my 22 revolver for at least 10 years. Yes, the fit and finish is not the same as Rugers and S&Ws, but you are not paying the price of a Ruger or S&W, so manage your expectations, this is a FIELD gun, not a collector. However, they shoot straight and are reliable. Great side arm when hunting small game or plinking. You may have to file or bend the front sight a little to get it on target, but once you hit center it's a straight shooter. Great budget plinker & homestead gun. Bought my first Heritage 22 here for Black Friday week sales, and I didn't expect much for my $110... Yet I'm pleasantly surprised by this gun! It shoots a wide variety of ammo reliably and it is stupidly accurate! I have a 18" plate at 100 yards, and I can hit it 6 out of 6 shots with the cheap Zamak alloy cast-notch rear sight, and simple front blade. I didn't need to "adjust" the front post or anything for it. Be sure to clean it before shooting it - for $100, don't expect a lot of hand fitting / finishing. I had low expectations honestly, but thought I'd try this... There was still a lot of CNC machining oil, and even machining metal shavings all over the inside of the cylinder and barrel. Once cleaned out, I put a few shots through it. I've already used it to kill off a few of our hens that were critically wounded by a predator at our homestead. Shoots anything from 22 shorts / CB / Colibri rounds up to 22 WMR if you get the WMR cylinder for $30 online. Awesome budget gun for the money - I will definitely be buying at least 2 more in the future. Maybe one more this size, and one more smaller 3.5" barrel version. Yeah, your right, for $110 your expectations should have been much higher 🤦‍♂️. Dude don't be a 💩+ ☹︎. Best bang for the buck I can remember! I cant remember how many I have bought (at least 9) and every time I get one my kids & grand kids borrow it. I still have a couple in the safe for now. They forget I like to shoot them too. They have great customer service if needed. I have bought a few of the mag cylinders & they are loud because it is a revolver . Most like the long rifle but the mag is still king. The pistols are remarkably accurate! Great little pistol, exactly as advertised. Check transfer fees at your local gun dealers to find the cheapest before buying online. The price may be lower once adding a transfer fee buy purchasing it directly from local shop. Love the pistol. Got this for my 11yr old son. It's perfect! Feels solid, great fit and finish. sweet shooter for the money! A lot of fun for the price. Great price and so much fun plinking. I ordered two of these and was impressed when I opened the first box. Opening the second, however was a different story....the frame around the cylinder was missing paint in several areas. I expected the frame to be blued like the barrel but it’s lightly painted black instead. Apparently quality control was on vacation the day this pistol was made. I guess that’s what you can expect when buying a lower priced gun. Other than cosmetics, it’s a very nice, balanced handgun and functions great. Wow! I love single action revolvers. OMG! Great fun. Can’t beat the price. If you are looking for a cheap small caliber gun to just waste ammo you will enjoy this. Palmetto is great. I might even buy the mag cylinder ( just $30 direct from Heritage ) for some big bang .22 .. Get one! you'll enjoy it .. THIS IS THE SECOND ONE I HAVE PURCHASED AND I REALLY LOVE THEM. 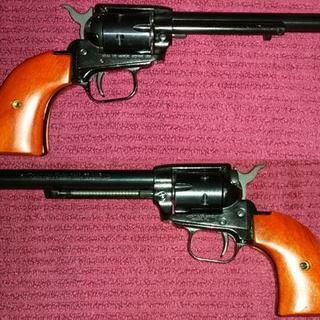 THIS ONE HAS A LONGER BARREL AND I ALSO PURCHASED THE MAGNUM CYLINDERS FOR BOTH AS WELL. IT SHOOTS AWESOME AND IS ALOT OF FUN AS WELL IF YOU LIKE REVOLVERS AS I DO. Finish is nothing to look at. I bought this when it was a daily deal for $100. It’s a lot of great little gun for the price. The action is clunky but it’s real accurate. The picture below was from 25 yards. 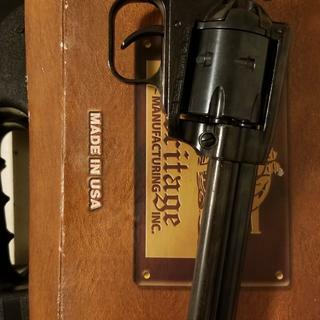 Also ordered the 22 mag cylinder from heritage. Slow shipping but the cylinder works great. On the whole I’m happy I bought this thing on a whim while drinking beer. 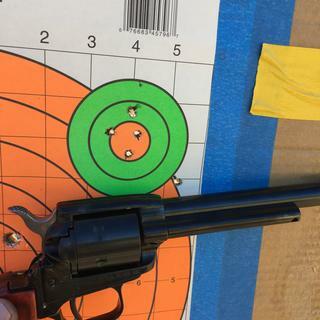 A single action revolver with a 6 1/2" barrel is fun to shoot. I paid more for mine elsewhere but it's worth every penny. I shoot AR's mostly, but it's fun mess around with western style revolvers and shoot the stock iron sights. Bullets for a nickel, what's not to love?